Sodium tetraborate decahydrate, commonly known as borax, is a natural mineral made of sodium, boron, oxygen and water, and is a good thing to have in your storage. It has many uses in your home, and if kept in a dry location, the shelf life of borax is virtually unlimited. Keep roaches, waterbugs, and ants away by sprinkling a combination of equal parts all-natural borax and sugar. Keep the mice out by sprinkling borax on the floor along the wall. Kill fleas by sprinkling borax on your carpet. Leave it for an hour and vacuum it up thoroughly. Combine cornmeal with borax. Pour into shallow dishes and place them in areas where pests are a problem. Make an all-purpose cleaner by mixing 2 tablespoons borax and 2 cups hot water in a spray bottle. You can remove oxidation from metals with borax. The ingredient is also used as a flux in welding. As a laundry detergent, add one cup of borax to each load and significantly boost your cleaning power. Make your own dishwasher detergent by mixing 1 tablespoons borax and 1 tablespoons baking soda. For removing urine odors from a mattress, wet the mattress rub in borax with a damp cloth. Let dry, then vacuum up the remaining residue. Just 1/2 cup of borax poured down drains will help unclog them. Pour 1 cup of borax into toilet bowls at night and in the morning, scrub bowl with a toilet brush. A paste of water and borax can scrub away sticky residue from adhesives. This is an unusual application of borax but will help homemade candles produce less ash and smoke. Dissolve 2 tbsp. table salt and 4 tbsp. borax in 1 1/2 c. warm water. Soak a 1-foot length of regular cotton kite string or twine in the solution for 15 minutes. Hang the string with a clothespin for five days to be sure it is completely dry. Use a paper clip to dip the string in melted wax three or four times, coating it completely. Hang it up to dry as before. Store wicks rolled up in a newspaper. Safety Source for Pest Management states the following regarding uses and toxicity. “While exposure to boric acid has been linked to adverse health effects, experts agree that careful application offers a safe and effective alternative without the indoor air problems associated with sprays. Boron is a naturally-occurring element in the earth’s crust and background levels even circulate in the human bloodstream. Boric acid’s exposure risks are minimal because of its method of application. This is a good item to keep in your storage, just use some common sense. It is inexpensive and readily available in most grocery stores. You’ll find it in the laundry soap aisle. This entry was posted in Clothing, Sanitation and tagged borax, candle wicks, Howard, laundry soap. Bookmark the permalink. I remember 20 Mule Team Borax being the sponser of Death Valley Days. (OLD show). I am looking for the model of the 20 mule team ” Death Valley Days” which has the red wheels and mules. I need the kit for repairs for the one my Dad has. Would you have any idea where one could be gotten at a reasonable cost. Try Ebay. They have almost everything. 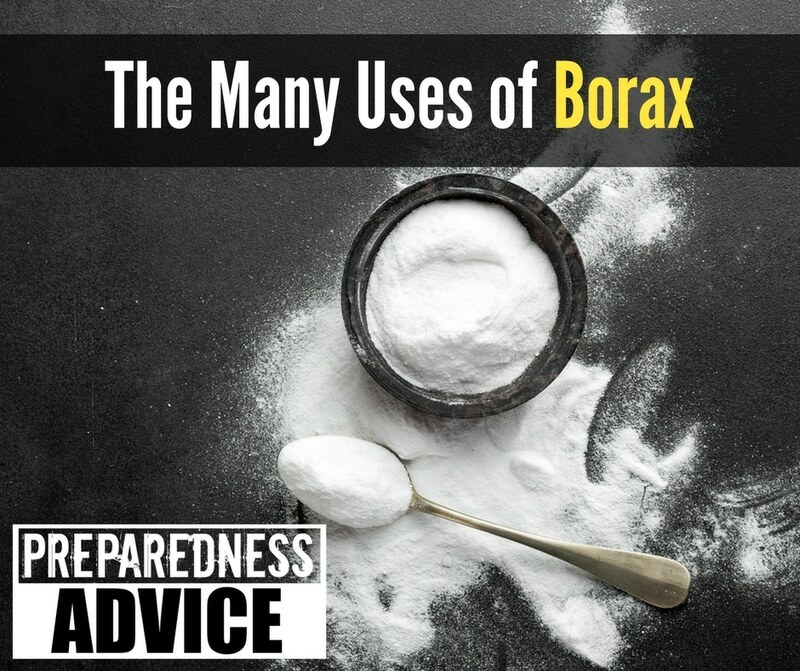 For pest control, you want boric acid, not borax. Not the same thing. Bugs just crawl right over borax. Both work, I have confirmed this with several pest control operators. I use corn meal on all the ant beds I find. Ants love it and when they ingest it cannot digest it…they explode believe it or not. My ant beds are GONE! Your page is for uses of borax, and you then mention pesticide uses for boric acid. This may confuse many people. Borax is not boric acid. Boric acid is formed from combining borax with sulphuric acid. Combine borax with resolve and you can get ink stains out of white polo shirts and other tough stains!!! #1 get a barn-yard cat. #2 take an old fashion mouse trap and wire a piece of pecan to it. Can i use borax welders’ choice as herbicide and fungicide? Please i need your kind answer. Thank you. I was thinking of insulating my basement on the cheap using pallets filled with shredded paper soaked in borax (fire retardant) then paneled. Is this feasable? Do you have any suggestions or ideas on additional additives? Small amounts of 20 Mule Team Borax spread into the garden provide trace amounts of boron. Also, at the same time, toss around some Epsom Salts. Your garden will thank you. Also good for drying fish roe to use as bait. Helps it stay on the hook longer. with “oakum” is a extremely good gun barrel cleaner. The oakum deforms better than patches.and cleans the rifling grooves much better than gun patches and cleaning solutions. Another use for Borax: metal smiths use it to ‘season’ new ceramic crucibles before using to melt gold, silver, etc.,. It’s a critical first step to remove the coating on the ceramic so the metal doesn’t stick. A couple of pinches are placed in the crucible, then spread out and burned off using a torch and the crucible is then ready for use. Who knew?? ?